I think it's spring!!! Hmmmm....I'm not sure. 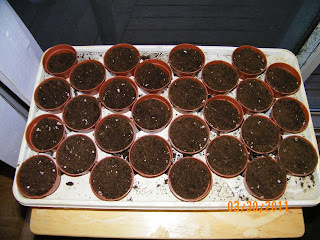 Just in case that spring is thinking of not showing up, well....I'm planting seedlings and putting eggs in the incubator. I'm trying to entice spring to stay. I'm hoping that I'll be successful. This year we are trying out brussel sprouts. 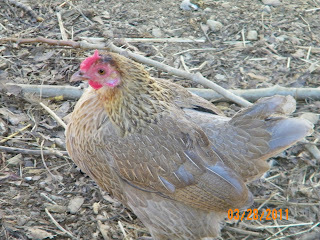 Even Bibi the hen wants it to stay. That way she gets to scratch around the yard every day. We are getting our calf Friday. The dairy farm called and one of their cows gave birth to a very big boy calf. It would have been better if we would have had him in a month from now, but you gotta take him when they're available. Have a Blessed Spring day!! I hope Spring is here! I'm excited about the eggs! And the calf!!!! The eggs look exciting! I love your kitty. I too thought that spring was here, but it's snowing this morning. Ha ha Mother Nature, you fooled me on April fools day! Good one! Drat I tell ya Lisa! We got more snow on Friday and possibly even more on Sunday night coming our way! I'm am so sick of winter. The trees are getting small plump little buds and I sure hope they don't get froze. 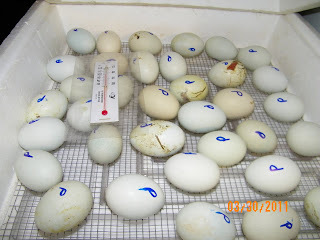 We've never incubated eggs before, sounds like it would be fun to watch tho. 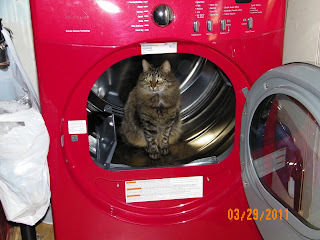 Very nice dryer your kitty is in too :) Love that color! Will you be bottle feeding the new calf?